Surface mounted! No holes to dig! Fill hollow pedestal with sand or gravel. 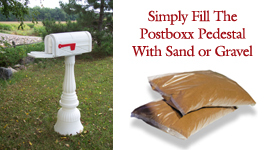 You will need about 30" of a relatively flat space and 80 pounds of sand or other ballast to "fill" the mailbox. The Postboxx Mailbox and pedestal are one unit and made of sturdy, heavy impact polyethylene. 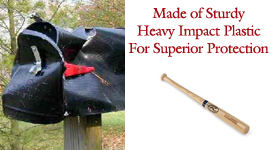 It Cannot be smashed with baseball bats or vehicles and will weather any storm. 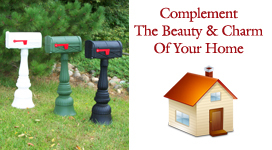 The postboxx is made to compliment the beauty and charm of your home. It comes in a variety of colors as seen above and requires no painting. Cleans easily. Just wipe it or hose it off. Powered by: Interlink Group, Inc.